The people from PLENT that participated in the round table have produced a document summarizing the arguments and the position defended in front of the Members of the European Parliament that attended the event, regarding the EC PROPOSAL OF DIRECTIVE ON WORK-LIFE BALANCE. This document has been sent via email to the MEPs who participate in either the EMPL or the FEMM commissions at the EP that are dealing with de Proposal. At present, the caregiving work in our societies is carried out at the expense of women’s time, effort, professional career, earnings, pensions and other social and political rights. This is to say, the current caregiving system for new-born/adopted children places the onus of care almost entirely on women. This caregiving system is largely sup ported by the current design of maternity/paternity/parental leaves -the design being deeply intertwined with the use people make of the days of leave. The EC has recognized that equal use of parental leaves is a pre-condition for gender equality. “Equal use” for PLENT means same time fully in charge of the child during at least the first year. The present design of M/P/Parental leave systems in the member states differ largely from country to country, but none of them achieve or even set the goal of equal use. The underlying reason is that none of these designs take into account the “golde nrule” uncovered by social researchers on the use of leaves: even when leave is available to them under the regulations, men do not take it up if it is transferable/sharable or badly paid (under 80% of their current salary). For this reason, neither the current EU Maternity and Parental leave Directives nor the proposed new Directive on Work-Life Balance allow for achieving the goal of equal use. In order to overcome the shortcomings of both the present and the proposed EU regulation on this matter, PLENT advocates for the drafting of a single brand new Directive that would unify the regulations of both the current Maternity Directive and the proposed Work-Life Balance Directive (see PLENT press release of 6 th June 2017). These two pieces of legislation are actually addressing the same situation whereby the baby needs care from his/her parents during at least the first year of life, the mother needs to recover from giving birth and take care of the new-born, and the father (or the other member of the couple) needs to take care of the recovering mother and the new-born. The resulting unified Directive should compel member states to reform their present leave systems as to achieve equal, non-transferable and 100% paid leaves for mothers and fathers in the short/medium term, without small print that may prevent equal use. The resulting Directive should also set minimum standards and prevent further developments in the transposition to the national laws that may create imbalance between the parents in the uptake of leaves. A number of MEPs expressed their view that unifying the two Directives would be tactically inadvisable, given the present correlation of forces at the EC and the EP. 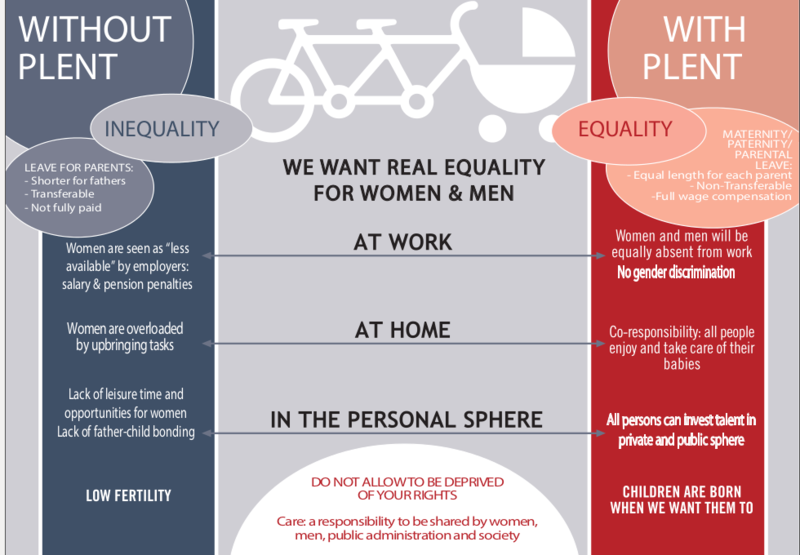 PLENT does not support the proposed Directive on Work-Life Balance because it does not set the goal of equality for each and every country in the EU; it does not set thegoal for every EU country to reduce/extend its current maternity, paternity and parental leaves, to individualize sharable/transferable parts and to increase the remuneration (whatever applies to each country), in order for any mother or father to have the same right to the same duration and well (100%) paid individual leave, where the minimum duration is established by the Directive. a). Extend the paternity leave up to 14 weeks, to be taken at any point during the first 12 or 18 months of the life of the baby, when the father will fulfil the role of sole/primary carer, with an additional clause stating that whenever the maternity leave is changed (in the corresponding Maternity Directive) then the paternity leave would be automatically changed to the same extent. What we intend is to keep the equality between the leave entitlements of both parents so that the TOTAL leave available for any person, mother or father, is just the same: maternity + parental should be equal to paternity + parental (14week + 4month = 30 weeks for everyone). Another way of achieving this same goal is to keep the paternity leave to 2 weeks (as it is actually in the Proposal) and add up to 12 weeks of non-transferable parental leave available only for fathers (not mothers), to be taken at any point during the first 12 or 18 months. Again this should be supplemented with an additional clause stating that whenever the maternity leave is changed (in the corresponding Maternity Directive) then the additional 12 week father’s parental leave would be automatically changed to the same extent. b). Increase the remuneration of all Paternity/Maternity/Parental leaves up to100% of the salary (with a cap, when necessary, as many other social benefits). Caring is a social need and no one should be deprived of his/her income for devoting a short period of his/her life to doing it; on the other hand, there is no better incentive for men to take the leave than having it fully paid. c). Eliminate the possibility of uptake of parental leave on a part-time basis in combination with reduced working hours at the same time. This is to prevent differential behavior of women taking double duration with half pay. d). Reduce the available period for up-taking the four month parental leave from 12 years down to the first 12 months or 18 months of the life of the child. This is to prevent differential behavior of men taking the leave in a piecemeal way all along 12 years. e). Introduce a new article banning adaptations or further developments of the current national regulations that may create inequalities in the final design and/or in the predictable use of Paternity/Maternity/Parental leaves, when transposing the Directive into the national laws. Tagged European Directive, PLENT News, work-life balance. Bookmark the permalink.